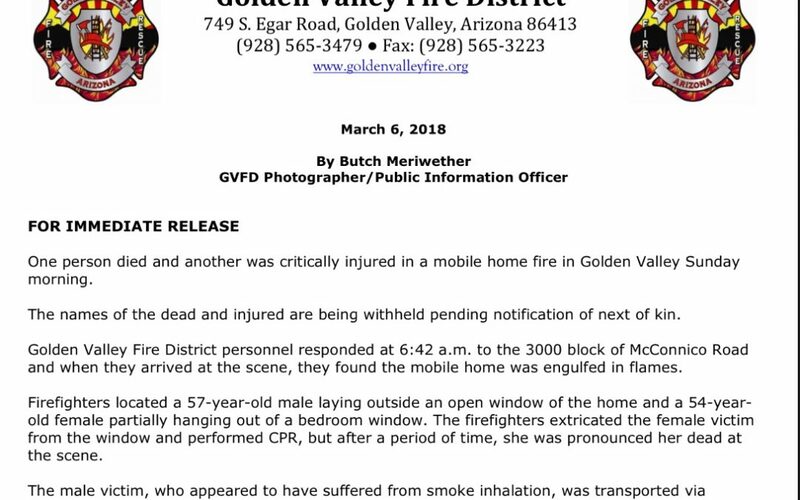 One person died and another was critically injured in a mobile home fire in Golden Valley Sunday morning. The names of the dead and injured are being withheld pending notification of next of kin. Golden Valley Fire District personnel responded at 6:42 a.m. to the 3000 block of McConnico Road and when they arrived at the scene, they found the mobile home was engulfed in flames. Firefighters located a 57-year-old male laying outside an open window of the home and a 54-year-old female partially hanging out of a bedroom window. The firefighters extricated the female victim from the window and performed CPR, but after a period of time, she was pronounced her dead at the scene. The male victim, who appeared to have suffered from smoke inhalation, was transported via ambulance to KRMC and was later flown via helicopter to University Medical Center in Las Vegas where he remains in critical condition. A total of 12 firefighters responded to the early morning fire, including three fire engines and a water tender from GVFD and one battalion chief and one fire engine from Kingman Fire Department because of a mutual aid agreement the fire department and fire district has. The call was made at 8 a.m. noting the flames had been extinguished and that the living room, kitchen and one bathroom had burned, but the bedroom where the victims were originally located in only suffered smoke damage because the bedroom door was closed. The exact cause of the fire is currently under investigation by GVFD Captain Dave Martin and the cause of death of the female is pending an autopsy and investigation by the Mohave County Coroner.